Dünn, aber nicht zu dünn. Asus scheint den besten Kompromiss aus einem dünnen Gehäuse, Stabilität und Leistung gefunden zu haben. Aufgrund der Diät muss man aber auch in diesem Fall auf einige wichtige Funktionen verzichten. 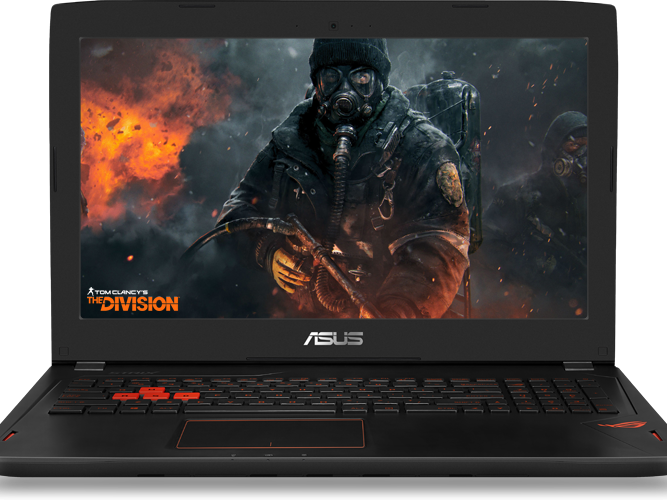 Mit dem Asus ROG Strix GL502 liefert Asus ein gutes Gaming-Notebook ab, welches in der nativen Full HD Auflösung aktuelle Spiele-Titel mit hohen Frame-Raten beschleunigen kann. Im Asus ROG Strix GL502 Test gefällt uns außerdem gut, dass das Gaming-Notebook vergleichsweise leicht und flach ausfällt. It's rare for us to be this thoroughly impressed with a gaming laptop. Aside from the minor knock against battery life, there's nothing wrong with Asus ROG Strix GL502. In fact, almost everything else about the machine is stellar from the crisp keyboard, loud speakers, stunning screen and solid Full HD gaming experience. This is one of the best all-around gaming laptops we've ever reviewed, hands down, and we recommend it if you're in the market for a solid mobile PC gaming system. The design of the ROG Strix GL502 is consistent with all the other Republic of Gamers products ASUS has released. If anything, the Strix GL502 is little more subdued than other ROG gear. There's just a few splashes of neon orange here and there to differentiate this gaming beast from your work laptop. It also only weighs 2.2kg and is 23.5mm thick - amazingly compact for a machine with a high-end CPU and GPU. You could easily transport this from home to work or school every day, unlike the gaming laptops of just a few years ago. While we approach every review without any bias, we've come to expect good things from ASUS in the gaming category, and for the most part the ROG Strix GL502VT-DH74 delivers. At just 4.85 pounds, it's relatively lightweight for a gaming laptop, and its waistline of 0.92 inches is far skinnier than what you'll find on the bulk of desktop replacements out there. A thin-and-light gaming notebook without compromise is something of an oxymoron—we have yet to test one. However, with each model we review, it’s becoming apparent to us that notebook makers are compromising less. The Asus RoG Strix GL502VT is standing evidence of that. Well, the Asus GL502VT ROG Strix gaming laptop can’t really convince us, no? The machine itself has no too significant caveats for such a price. Performance is good as can be expected. Noise is relatively low. Keyboard and touchpad are quite good and comfortable. It is relatively thin and lightweight. For the size and the price, the $1,599 Asus ROG Strix GL502VT is definitely a keeper. Garish color accents aside, the 15.6-inch is fairly portable and packs a wallop. Even better, if offers a captivating 1080p display, a comfortable keyboard and nearly 6 hours of battery life. We just wish the GL502VT ran cooler and brought more bass. Positive: Solid workmanship; compact size and lightweight; long battery life. Negative: Poor display; average speakers; noisy under load; high price. Positive: Powerful hardware; good mobility; good battery capacity; reasonable price. Negative: Looks quite "kitsch" and overly bright. Positive: Good balance of mobility and performance; fast SSD; long battery life. Negative: Mediocre sound system; featureless design. Positive: Impressive design; high quality display; good speakers; powerful hardware; good price; high speed hard drive; good ergonomy; long battery life. Negative: Unsupport Thunderbolt3; only 1 RAM slot; mediocre sound, ineffective cooling system. Modell: Das Asus Strix GL502VT-DS74 ist ein Laptop, der für Gamer und Multimedia-Fans gemacht wurde, die nach einem leichten und schlanken Laptop für unterwegs suchen. Das Microsoft Windows 10 System verfügt über einen 2,6 GHz Intel Core i7-6700HQ Prozessor, eine Nvidia GeForce GTX 970M Grafikkarte, 16 GB DDR4 Dual-Channel-RAM, eine 128 GB Lite-On SSD und eine 1 TB Festplatte. Das in puncto Qualität und Robustheit als überdurchschnittich bezeichnete Chassis ist aus schwarzem gebürstetem Aluminium mit einem schwarzen und neon-orangen ROG-Logo in der Mitte des Bildschirmdeckels. Der 15,6 Zoll große Full HD IPS-Display mit einer Auflösung von 1.920 x 1.080 Pixel liefert der satte Farben, tiefen Kontrast und scharfe Details. Daher, eignet er sich für Gaming und Videoschauen. Zudem bietet er vier verschiedene Modi: Normal, Eye Care, Manual und Vivid. Die Tastatur mit Hintergrundlicht lässt sich einfach und komfortabel tippen und das Touchpad ist groß, reaktionsfreudig und schnell. Die Schnittstellenausstattung umfasst drei USB-3.0-Ports, eine USB-C-Gen-2-Port, einen HDMI-Port, einen Mini-DisplayPort, eine Kombiaudiobuchse, eine Mikrofon/Kopfhörerbuchse und einen Micro-SDXC-Kartenleser. Der Laptop wiegt 2,491 kg und seine Akkulaufzeit hält beim WiFi-Surfen bis zu 5:56 Stunden durch. 80.93%: Diese Bewertung muss man eigentlich als durchschnittlich ansehen, denn es gibt etwa ebenso viele Notebooks mit besseren Beurteilungen wie Schlechteren. Die Verbalbeurteilungen klingen aber oft besser als sie wirklich sind, denn richtig gelästert wird über Notebooks eher selten. Obwohl dieser Bereich offiziell meist einem "Befriedigend" entspricht, passt oft eher "mäßiger Durchschnitt".